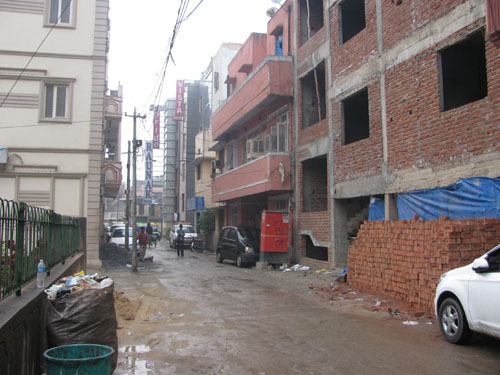 While waiting for my new driver, I wandered outside in front of the hotel to check out the Karol Bagh neighborhood. The street was very narrow and very busy. 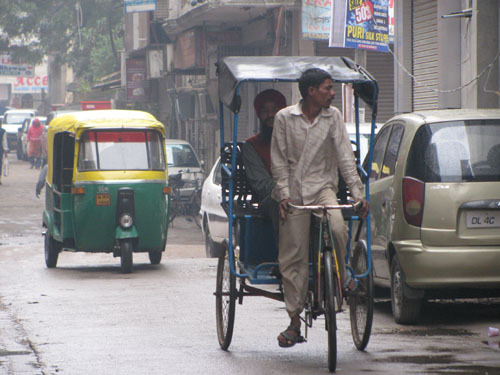 Tuk-tuks and bicycle rickshaws shared the street with cars, pedestrians and people pulling handcarts. 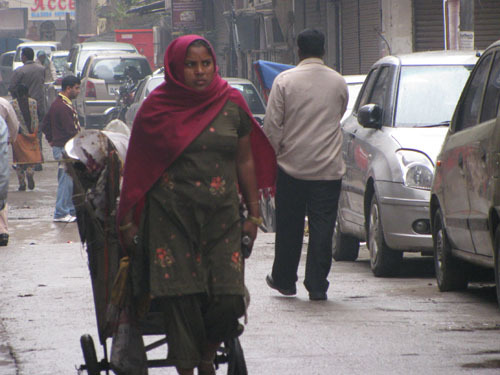 Trash collection and removal was done with handcarts. On the other side of the hotel, a new building was going up. 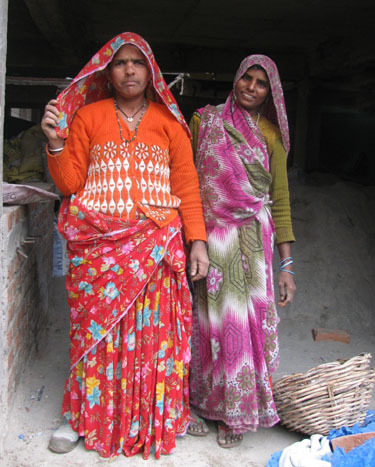 These women were working on the construction site, carrying loads of sand on their heads from outside to the interior. They didn’t speak English but were very friendly. The one on the left didn’t smile because she had bad teeth. I went back to the hotel so my new driver could find me. 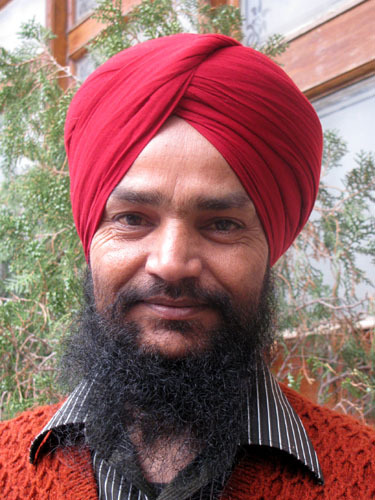 A Sikh man in a red turban was standing near the front door. One of the first lessons India taught me was, don’t believe everyone who tells you they speak English. “Do you speak English?” I said to the man. “Yah.” He said, but there was no explanation coming. He obviously didn’t speak English. Okay. But he had a nice smile. I took a couple of shots and showed them to him. He was quite pleased. “You look very handsome,” I said. “Very handsome,” he repeated, smiling. My plane was late. Arriving in the immigration area, the lines were horrendously long. Photography at most airports is usually prohibited for security reasons, but I couldn’t resist sneaking a shot of the beautiful hand sculptures on the wall just above the immigration processing windows. I hadn’t received a reconfirmation from my tour company that my driver would be at the airport at the appointed day and time, but there he was. At the time, I had no idea that Delhi’s sparkling airport had only been open since November. At the old airport, drivers weren’t allowed inside. At the new one, drivers may congregate behind a rope line in the hall just in front of customs. There are a couple of ATMs and a food court in this same hall. This entry was posted on March 31, 2011, in Delhi, India, Travel. 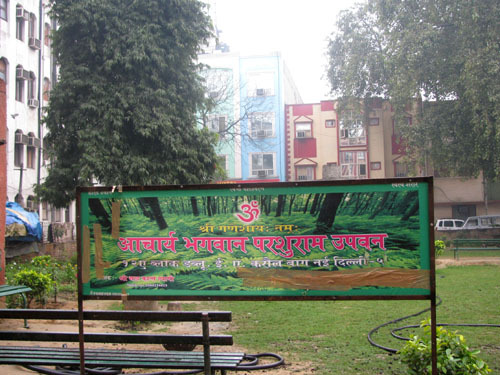 Namaste India Tours: Simply the Best! I’ve just returned from the 28-day tour of Rajasthan which I booked through Namaste India Tours. Without exaggeration, this was the best vacation of my life! I was a bit concerned a week before I left because I had sent two reconfirmation emails that hadn’t been answered. I left with some ideas of what I should do in case there had been a mixup and my driver wasn’t at the airport at the appointed time, but he was there so I never had to put Plan B in action. The driver’s English was very poor, and his understanding of mine seemed to be worse. He had trouble finding the car in the airport parking lot. It took him about 20 minutes. This didn’t instill any confidence. Lastly, he had a personality like a wet dishrag. I didn’t enjoy the thought of spending 28 days with this guy. Jawahar, the owner of NIT, called on the driver’s cell phone on the way to the hotel and asked to talk to me. I asked about the two emails that hadn’t been answered. He said he had been out of town for several weeks visiting family. Apparently he has no one that answers emails in his absence, but he does have a business partner who answered my previous ones. Regardless, I told him it had made me very nervous to be arriving alone so late at night without a reconfirmation that my driver would be there. He understood. The next morning Jawahar called me at the hotel. I mentioned the driver’s poor English skills. Jawahar advised that this driver was for Delhi only and that my assigned driver for the rest of the trip was a professional guide who had been delayed due to a problem at his home. I again expressed concern about the driver’s poor English. Jawahar said no problem, I’ll get you someone else for today. Since Jawahar was so quick to get me a new driver, I didn’t think it necessary to mention that the first one couldn’t find the car and I didn’t care for his timid personality. The second driver was delightful. His English was much better, and he was animated and fun. I only had one day with him. My assigned driver for the rest of the tour was fantastic! Prem was an excellent traveling companion, a good driver and a great guide. He was fun, entertaining and I really enjoyed his company. He was so helpful in every way. He made suggestions based on his observations of what I liked and didn’t care for that really improved the trip. And he also came up with a few ideas for things that hadn’t been on the original itinerary that were some of the highlights of my trip. 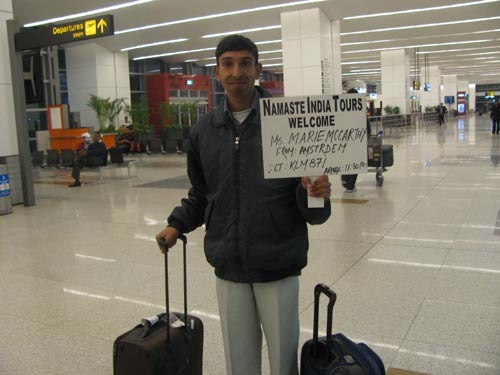 If you decide to book with Namaste India Tours, you can’t go wrong if you ask for Prem Baliyani as your driver/guide. He is simply the best. Only one issue came up during the entire trip. The hotel that we checked into at Jaipur had a series of things happen that I didn’t like that when taken separately might not have been a big deal, but there were so many of them that I didn’t want to stay there. Here’s what happened. There was no toilet paper or towel in the room. I had to ask for them. The toilet paper was brought a few minutes later. I had to again ask for a towel. The hotel restaurant was less than impressive. For a closed restaurant, there were far too many flies. That sort of thing makes me wonder what the food handling practices are. I usually don’t dwell on things like that, because it doesn’t do any good. But there were really too many flies. I made a point of asking the waiter if the dish I ordered was not spicy. He said it wasn’t. I specified that I wanted it mild. I ordered mutton biryani. While we were waiting for lunch to arrive, Prem asked the guy at the cash register about the elephant festival. You know, the annual Jaipur Elephant Festival that’s plastered all over the internet and has posters plastered all over town. The one that brings hundreds of tourists to town each year. He said it had happened in the morning and that it was over already. He made no effort to ask anyone else at the hotel to confirm the information. I told Prem that firstly, I thought the guy didn’t know anything and didn’t care to find out, and that bothered me. Secondly, we could go reconfirm the information on the internet. I didn’t like the guy’s attitude. Prem didn’t, either. My food arrived after quite a delay, but Prem’s wasn’t served until long after mine had gone cold. I wasn’t going to eat until Prem had his food, too. My order was so spicy that I couldn’t eat it, and the mutton was mostly bones and gristle, hardly any meat. Essentially, the only thing I could eat was the nan. Bread and water for lunch, yum. We then went to the reception desk where the hotel owner didn’t know anything at all about any elephant festival. He’s just the hotel owner who should be able to assist the tourists his facility is there to serve. And he knows nothing about an internationally famous cultural event that’s taking place in his own city. And he, too, couldn’t be bothered to try and find out any information. The hotel had no internet, so we were obliged to leave to go find an internet cafe. I was pretty annoyed by now but willing to stay for just one night of the scheduled four nights in Jaipur. Prem didn’t like the hotel staff’s responses, either. One phone call to Jawahar solved everything. Jawar said return to the hotel at once, check out immediately, and I’ll find you another hotel. We ended up staying at an old family-run guest house for four days that I really liked. The rest of the tour was really great. My expectations for this trip were already high, but NIT exceeded them. Without hesitation, I strongly recommend Namaste India Tours. Jawahar is very sincere, and he really does care about customer service. I believe he took my concerns about the email reconfirmations to heart and will try to improve on that. He did everything he said he would do, and more. I found him to be a very kind and honest person and would not hesitate to book another tour with NIT in the future. Details and photos on the trip will be posted once I get over my jet lag and have a chance to sort through the photos and trip notes. This entry was posted on March 30, 2011, in India, Travel, Trip Planning.